Hyundai says its new minivan has a dynamic, sporty profile. 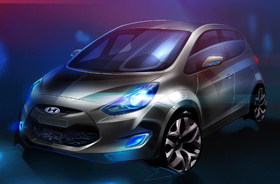 Hyundai will debut a small minivan called the ix20 at this year's Paris auto show. The company says the new model has a dynamic, sporty profile that is a striking departure from the more boxy-looking models typically found in the segment. Designed and developed at Hyundai's European r&d center in Ruesselsheim, Germany, the ix20 adopts Hyundai's new so-called "fluidic sculpture" design language first seen on the the ix35 medium SUV. The ix20 replaces the Matrix and will compete against models such as the Opel/Vauxhall Meriva and Renault Modus. It is a sister model to the Kia Venga, which went on sale in January. The ix20 will go on sale shortly after the auto show. In Paris, Hyundai will also unveil an updated version of its i10 minicar featuring a new 1.0-liter engine that emits 99 grams of CO2 per kilometer.